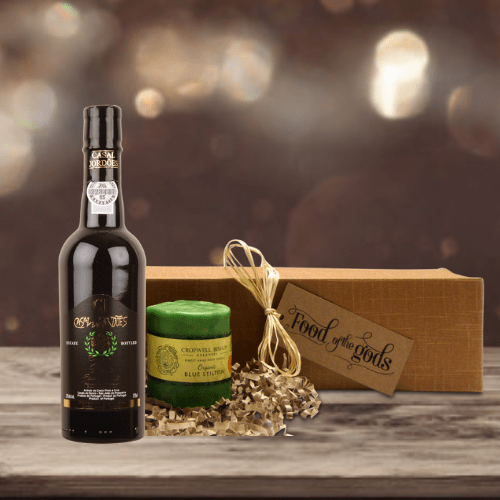 Categories: Christmas Hampers, Vegan, Wine. 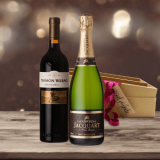 This luxurious gift of Champagne and Gran Reserva Rioja is a refreshing alternative to the usual Champagne and Port seasonal wine gift and is certain to be warmly received and appreciated. Seriously good wine gift for special occasions including Christmas but will make any occasion feel very special. Shimmering, satiny pale gold colour with deeper gold nuances and flashes of jade. Fine bubbles presage a champagne that is fresh and opulent. Floral (rich honeysuckle) and fruity (crushed pear, preserved lemon, peach) aromas mingle with soft creamy notes of biscuit and fresh crusty bread. Airing reveals a profusion of more intense and sumptuous notes of fig, grenadine, lily and sunflower, as well as spices such as star anise and liquorice. The sensation in the mouth is full and fruity, underlined by citrus aromas of lemon and orange. A sincere, diaphanous champagne of great generosity. Red mullet with cream of marinated Dublin Bay prawns, served on a bed of salad leaves, exotic fruit and fresh coriander. For the past 15 years, we have been members of to the group of wine development. The vines are grown organically and we follow minimal intervention in the vineyard to encourage biodiversity. We regurlarly attend meetings and training seminars, which allow us to share our methods and experience in winemaking and how it's evolved. We are constantly mindful of our impact on the environment and the quality of our product is our main priority. Based on a voluntary approach, sustainable viticulture aims meeting the qualitative, environmental requirements while preserving the perennially of the exploitations. Dedicated services made up of technicians and agricultural engineers were created on the initiative of each cooperative of the group in order to accompany our vine growers & partners throughout the cycle of the vine and to take part in the Magister network for the follow-up of maturity. Thus, our vine growers are sensitized, advised in order to improve their wine practices and to optimize the quality of grapes. Made in modern style, despite the 36 months in American oak, this is a deeply coloured blend of Tempranillo with 5% Mazuelo and 5% Graciano. It’s a youthful, concentrated red with plenty of backbone and structure, fresh acidity and layers of ripe plum and blueberry fruit.